Oatmeal cookies are a popular cookie for many and my friend Ted prepared the following recipe for our holiday cookie exchange this year. 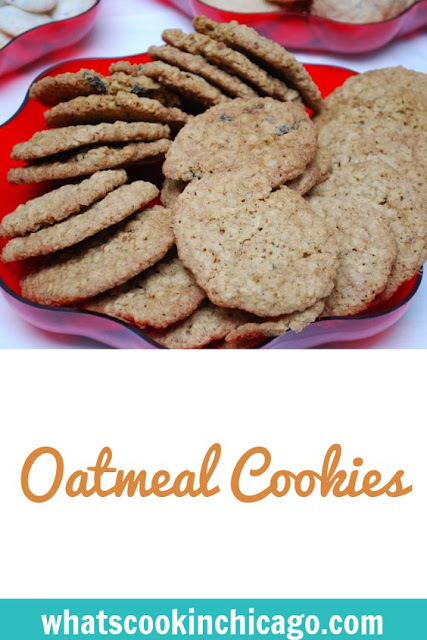 These were especially delicious as they had a nice slighty chewy texture and the addition of nuts and raisins made them even more flavorful. 1) Cream shortening and sugars. Add vanilla and eggs. 2) Sift the remaining dry ingredients except the rolled oats and nuts together and add to creamed mixture. 3) Add rolled oats and nuts. 4) Form dough into long rolls, Wrap in waxed paper. 5) Refrigerate to make easier to cut. Slice 1/4 inch thick. Cookies always come out big. No need to double recipe.